Blog post in partnership with Cricut. I have a HUGE blog post for you AND A HUGE GIVEAWAY!!!!!!!! Today I am joining several seamstresses to present to you the Cricut Explore Air 2. This is my first experinece with Cricut or a machine like this so I pretty much jumped when given the chance at playing with the Criut Explore Air 2. I think the hardest part of this machine was figuring out what to do! There are so many options that you can easily get lost in the Design Space. Speaking of Design Space I highly suggest setting up your account as soon as you get your machine. You will really want to start designing now! I had a very hard time narrowing down my project for today’s blog. I finally decided on making my daughter a t-shirt design for her 13th birthday along with a free hand appliqué on a skirt. Start designing!!! I spent hours on the Design Space Website playing with ides. Choosing vinyl colors for the project and other details like font style, size, placement, etc. Promise this was the hardest part! LOL!! So many amazing designs! Once you finalize your design on design space it’s time to set up the machine. It is Super easy!! After turning it on, plug it into your computer or use the bluetooth on your cell phone if you are designing off the Cricut app. Place the Vinyl on a mat with shiny side down (which is also the clear liner). If your design is small cut down the vinyl before placing on the mat. Open the Air 2 and slide the mat in. Move the smart set dial to IRON -ON or right between IRON-ON AND CARDSTOCK if you are using iron-on glitter. Then press GO on the Design Space and watch the magic happen!!! ***Make sure you click mirror image BEFORE cutting. Once it is done, slide it out of the machine and grab your wedding tool. The wedding tool will help take out the excess vinyl from the backing. Take off any excess iron-on around the design by peeling it from the clear lining. The is a great time to get the kids involved!!! I knew I wanted to free hand the collage on the skirt so I cut each design separate. Don’t trim the clear liner too close as you will need some left to be able to grab and peel off after its ironed on??? If you don’t want to free hand a pattern you can weld (merge) design so that they are printed all together on the Design Center. This video can help. I then laid my designs for the skirt on the fabric with clear liner side up and played with how I wanted them to be grouped. I layered a few pieces on top of each other so that the floral collage looked like a continues flow. While I was playing around with placement I ended up changing my mind on the color of the flowers. But this was an easy fix. Just grabbed the right color of vinyl and cut the flowers out again. Once I was happy with the placement I removed any pieces that sat on top of the first layer. Tip: If you’re not using the app and your working away from your computer screen, take a cell phone pic for reference so you remember how it should look. Use a hot iron on Cotton/Linen and a press cloth, and iron the designs to the fabric. Very important to use a press cloth and NO steam. Press each area down for 20-30 seconds. Repeat with reverse side of your fabric. Once it has cooled check a corner to see if all is secure. If it is then you are golden but if it is not press again for 15-20 more seconds. For my project I was not done yet. I still had a few pieces that needed to be layered on top of the first layer. I repeated step 8 with the second layer. For the my T-shirt design I did used the same technique. What helped me the most when deciding where to place the wording is I had my daughter put the tank top on and I pinned the iron-on in place. This way I could step back and look before committing with the iron. Cut your project out in cardstock before using up your precious iron-on. I used cardstock first and that helped me to decide on what size I wanted to use on the tank top. Check out more Iron-on projects to help you narrow down your project! See more HERE. Don’t be scared! Have funnnn!!! Cricut has a coupon for you! 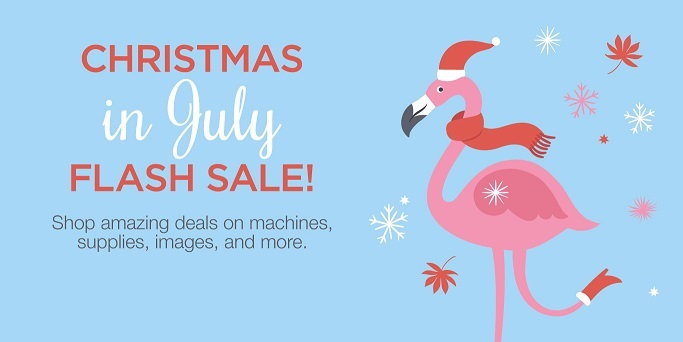 Use code:“ChristmasInJuly” Free shipping for US orders. Click the Image below. Ready to see several more projects from other seamstress, oh AND WIN A MACHINE FOR YOURSELF???!!!!!!! WAHOOO!!!!!! What a great giveaway!!! Happy birthday to your little lady. Thank you so much!! Her birthday is actually in August but thank you!! !